Regardless of the reason for removing the glass the principle is the same. The windows in the doors are in two parts. I am assuming that you have removed the door (card) panels to the inside of the door by removing the door arm rest along with the winders and the door opening handles. The felt weather strips also need to be removed from the top of the window doors. The front quarters have to be removed first, then the main window followed by the mechanisms after that. There are two bolts and an adjustment bolt at the top, this stud has a collar around it and adjusts the movement of the glass to the body. This bolt is adjusted by a Allen screw and look after the fitting as they are difficult to come by. My adjustment bolt was in upside down and unscrewed with my fingers. The adjustment should be behind the frame and then removed, I reinserted the adjustment for demonstration. 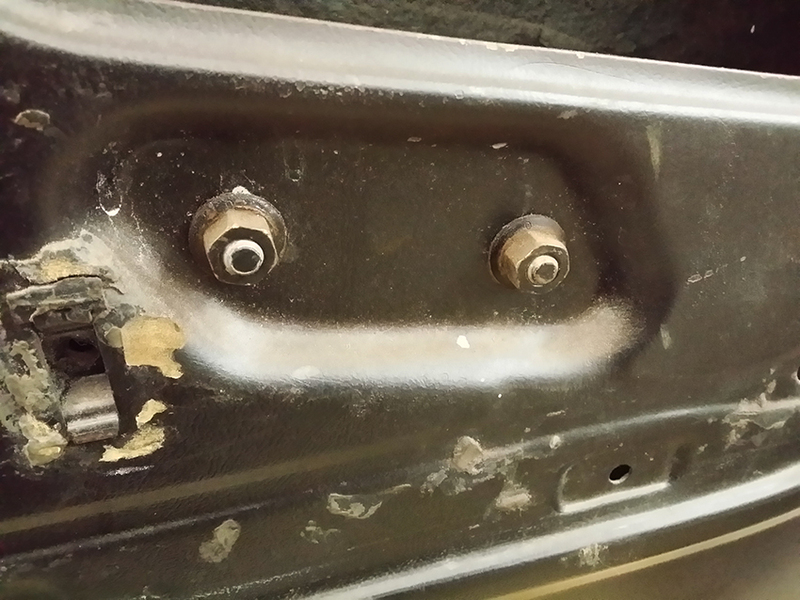 The other two bolts are spaced out on the frame with the more square holes for the fittings. The square washer bolt will go against the chrome work and not the bottom like mine was. In fact the bolts were all wrong. Once the bolts are removed the quarter will be able to be lifted straight out the top of the door gap. The front quarters also hold the guide and adjustment for the main window against the body. To remove the main glass needs to be removed from the winder mechanism otherwise it will not come out of the top slot. There are three sets of bolts to be removed, there are no adjustments at this point. Remove the two bolts to the back of the door which holds a horizontal rail, this will slide of the mechanism. Next you can undo the four bolts around the winder or the three that hold the other end of the mechanism. As you undo the last of the screws take hold of the glass to make sure it doesn’t drop to hard into the bottom of the door. The glass could be brittle and you don’t want to replace it for nothing. Once the mechanism is free from the door frame, manoeuvre the mechanism arm free from the slider at the bottom of the glass towards the front. When the arm is free from the glass runner, lift up the back of the glass and pull it upwards to the top of the door and it should come out easy enough after the last slider is free from the mechanism. It will be tight on the removal but it just about fits to lift out. Reach inside the larger gap in the door frame towards the rear and pull the mechanism out through the hole. You may have to twist things around a little but it will come out. The reverse principles are applied, Main glass in first then the quarters. But the problem now being is how to get the glass sliders onto the rails. The front arm is pretty tight to the winder mechanism and has to be lifted into place. Once you have one side in place then move the glass in order to fit back onto the runners. When the runners are in place lift one end of the mechanism to the hole and take the weight. Do the same for the front and then replace the rubber block at the bottom just in case it drops down. Align all the bolts up and tighten to a nip at this point. The last part is the front quarters. These have to be inserted and adjusted, do not tighten fully at this point. The adjustment on the quarters will determine how the glass fits to the weather strips and the body work. When the adjustments are satisfactory lock all the bolts in place. do you accually have to take the quarter window out in order to get main window out? how do you get window felt back in after window is installed? Taking out the front quarter gives you extra room. The front quarters have the long chanel to guide the glass. The window felt are held by sprung clips on the back that just press into place on the door frame and should be done before te window goes back in. 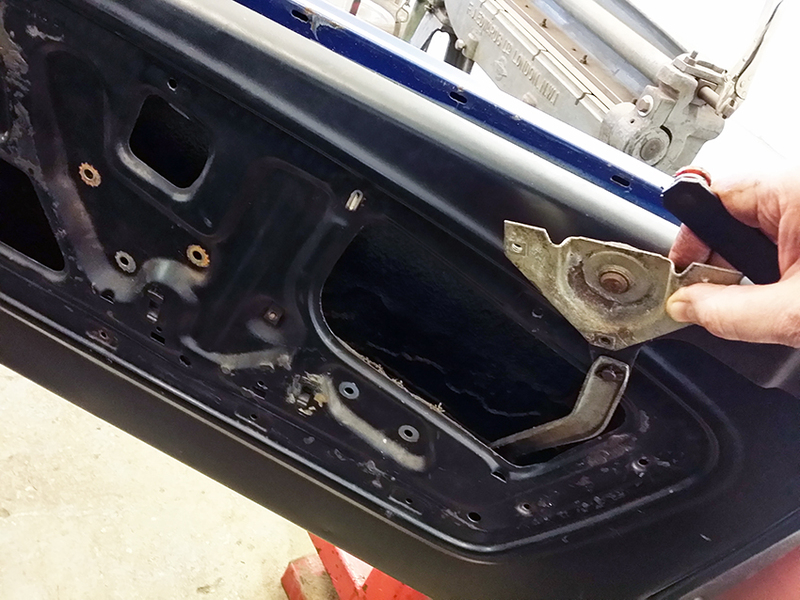 How did you get the adjuster bolts reinstalled with the quarter window assembly in the door? That is the issue I’m running into. Hi, I think the bloke who had it before me also had the same issue. They weren’t fitted as they were in a box of bits thrown in my trunk. The glass will be going back in soon with the guide nice from MM. I will find out and post soon. Those adjuster bolts are extremely difficult to find, so don’t loose them. Was this the front or rear quarter windows? Yeah Ive been having a problem getting the adjuster bolts into the window after its been slid into the door. The front quarters have 2 adjusters, one at the top and one at the bottom of the long stem. The secret is to slide the glass into the door and before its all the way down screw the adjuster all the way in. Then drop the window down. The bottom adjuster can be screwed in as there is enough movement to allow the fitting. Withe the adjusters in place, position the window and insert the square washer bolt and nip up. Adjust away for final positioning. Hope that helps. I intend to post some pics today of fitting as I installed mine yesterday. The main window is a bit of a pig I must admit. The window is heavy and has to be lifted out at an angle. The door trims may also need to come of to get the window out.